Amanda Jennings’ work represents the best in the psychological suspense genre: obsession, grief and the need for security played out with great pace. I was glad I had a free day, for her latest offering accompanied my day, as the novel was one that I found impossible to put down, until the very last page. 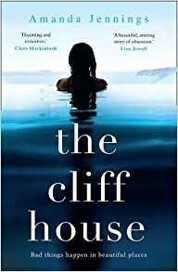 The Cliff House is set in Cornwall, as is her previous (and well-received) novel In Her Wake. It appears that the author is well acquainted with the South West of England, as her mother’s family stemmed from there and the Cliff House of the title is set on the West Penwith coast. Tamsyn was only ten when her beloved father died in a traumatic lifeboat disaster, and now years later as a teenager his loss overshadows her. Her mother is a cleaner at the Cliff House, the subject of Tamsyn’s dreams and fantasies and to which she is obsessively drawn. One day, the first day of the school holidays, Tamsyn creeps out of her home on a familiar mission: to spy on Cliff House and its occupants, whom she believes have the perfect life. The house is owned by a famous writer and his glamorous wife (the Davenports), who only visit it at weekends; so it’s on Fridays that Tamsyn can watch (from afar) their dramatic arrival at the house and their perfect lifestyle. But this Friday is different. There is no sign of the Davenports, and Tamsyn indulges her fantasies to the limits, roaming through the house and plunging into the swimming pool. But the house is not empty. Edie is there, the tearaway teenage daughter of the Davenports intent on her own psychological problems. She too has needs. What happens then sets in motion a train of events that leads to an explosive finale. The author’s hauntingly atmospheric style, both evocative of the Cornish setting and of Tamsyn’s story, makes this a thriller not to be missed, as it as mesmerising as it is gripping, for it is indeed a one-sitting read.